Supernova 1987A, discovered in 1987, is the closest exploding star to Earth to be detected since 1604 and resides in the nearby Large Magellanic Cloud, a dwarf galaxy adjacent to our own Milky Way Galaxy. In addition to ejecting massive amounts of hydrogen, 1987A has spewed helium, oxygen, nitrogen and rarer heavy elements like sulfur, silicon and iron. Supernovae are responsible for a large fraction of biologically important elements, including oxygen, carbon and iron found in plants and animals on Earth today. Since the supernova is roughly 163,000 light-years away, the explosion occurred in roughly 161,000 B.C. (One light year is about 6 trillion miles). Many astronomers today believe that one of the most plausible reasons we have yet to detect intelligent life in the universe is due to the deadly effects of local supernova explosions that wipe out all life in a given region of a galaxy. The University of Colorado Cosmic Origins Spectograph team using NASA's newly refurbished Hubble Space Telescope recently observed the supernova in optical, ultraviolet and near-infrared light, charting the interplay between the stellar explosion and the famous "String of Pearls," a glowing ring 6 trillion miles in diameter encircling the supernova remnant that has been energized by X-rays. 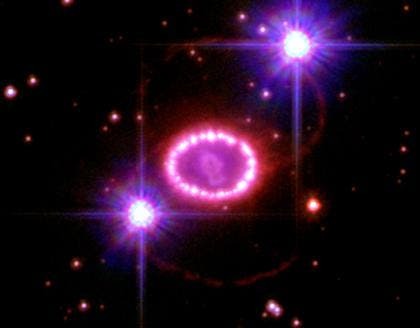 The gas ring likely was shed some 20,000 years before the supernova exploded, and shock waves rushing out from the remnant have been brightening some 30 to 40 pearl-like "hot spots" in the ring — objects that likely will grow and merge together in the coming years to form a continuous, glowing circle. "The new observations allow us to accurately measure the velocity and composition of the ejected 'star guts,' which tell us about the deposition of energy and heavy elements into the host galaxy," said CU-Boulder Research Associate Kevin France of the Center for Astrophysics and Space Astronomy and a member of the Cosmic Origins Spectrograph science team since 2007. "The new observations not only tell us what elements are being recycled into the Large Magellanic Cloud, but how it changes its environment on human time scales." Hubble is the only observatory in the world that can observe the brightening of the String of Pearls in ultraviolet light, said France. Most of the data for the study was gathered by the Space Telescope Imaging Spectrograph, or STIS, which was installed on Hubble in 1997 and was one of the workhorse instruments before its power supply failed in 2004. A faulty circuit board on STIS was replaced by astronauts on the final Hubble repair mission in May 2009. The team compared STIS observations in January 2010 with Hubble observations made over the past 15 years on 1987A's evolution. STIS has provided the team with detailed images of the exploding star, as well as spectrographic data — essentially wavelengths of light broken down into colors like a prism that produce unique fingerprints of gaseous matter. The results revealed temperatures, chemical composition, density and motion of 1987A and its surrounding environment, said France. "To see a supernova go off in our backyard and to watch its evolution and interactions with the environment in human time scales is unprecedented," he said. 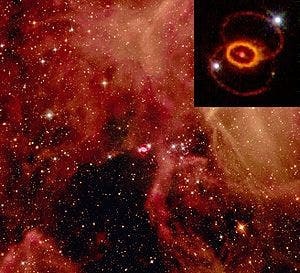 "The massive stars that produce explosions like Supernova 1987A are like rock stars — they live fast, flashy lives and die young." "In the big picture, we are seeing the effect a supernova can have in the surrounding galaxy, including how the energy deposited by these stellar explosions changes the dynamics and chemistry of the environment," said France. "We can use this new data to understand how supernova processes regulate the evolution of galaxies."